For the past year, Bruce has been collaborating with Dr. Vahid Bokharaie of the Max Planck Institute of Biological Cybernetics in Tübingen, Germany on an exciting research project. Using Bruce’s photographs for the study, participants are shown a new scene (one of Bruce’s photographs), and eye-tracking instruments detail where the eye goes first, how long it remains there, where at goes next, at what velocity, how long it remains there, and so forth, until the participant has fully inspected the image (i.e., the scene), then moves on to the next “scene” (another photograph supplied by Bruce). 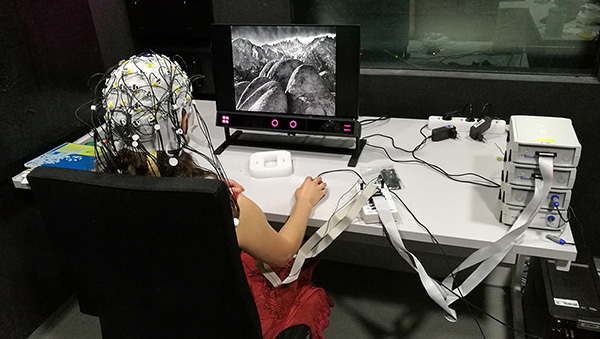 The participant is also hooked up to multiple electrodes monitoring which areas of the brain are activated during the complete investigation of each image (see the set-up below). This is a major study of the human visual system, and how it interacts with the brain whenever activated. Bruce’s recommendations about how to effectively conduct the study, and his observations and suggestions to Dr. Bokharaie have made significant improvements to the ongoing study. Bruce just completed an eight-day workshop in Iceland (February 23 to March 2), in which he was the invited co-instructor with Alexander Ehhalt and organizer Achim Casper (both from Germany). 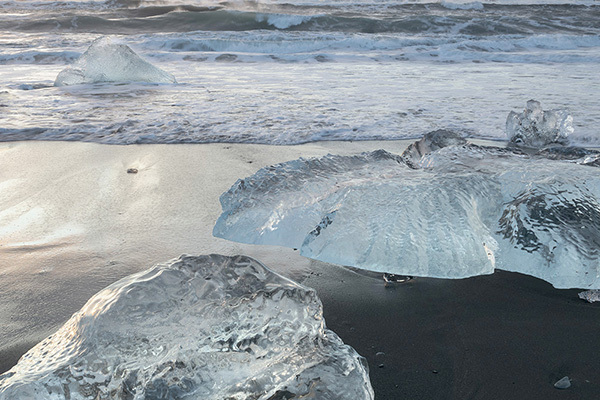 The workshop took place along both the south coast and the west coast of the island, with stops at magnificent cliff-top overlooks of the ocean, at several glaciers, at the remarkable ice-beach where ice from the terminus of one glacier floats out to sea, then is pushed back onto the shore by wave and tidal action (see photograph below). All in all, it was a marvelous, productive and educational week for everyone. Bruce has been writing articles for two magazines devoted to traditional film-based photography: “Darkroom Underground,” an online magazine published quarterly by Tim Layton in the USA, and “PhotoKlassic” an international magazine all in English, but published in Germany by Marwan El-Mosayan. Darkroom Underground sprang to life about two years ago, and features a variety of articles about photography and photographic processes dating back to the beginnings of photography (including Daguerreotypes, Cyanotypes, Tintypes, Platinum/Palladium and all forms of pre-digital processes). PhotoKlassic recently expanded from a German-only publication to it’s current international scope just recently. Bruce’s articles are considered to be among the most highly regarded in both magazines. Next year—2020—will be Bruce’s 50th in photography. 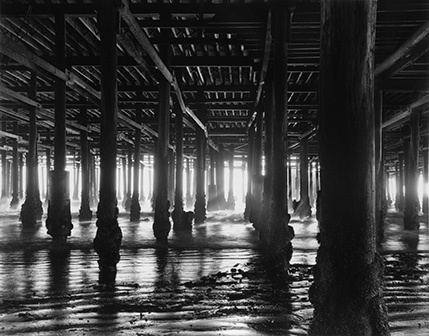 Bruce turned to photography as his life’s work, while always looking upon it as a wonderful hobby, in 1970. Over the years he has had numerous gallery exhibits, his work is in the collection of many museums and private collectors, he has published six books, and has taught workshops in North America, South America, Australia and Europe over a span of nearly all those years. Bruce’s major photographic projects include his groundbreaking studies of the slit canyons of Arizona and Utah, studies of the cathedrals of England, studies of the Mesquite Sand Dunes of Death Valley, and many others that have earned him accolades worldwide. At this point he is just as excited about photography as he has always been, as those who have worked with him or studied under him can attest. These days Bruce maintains a full schedule of photography workshops, including his backpacking workshop into the many side-canyons of the Escalante River in Utah each year. Producing photographs, and teaching others how to improve their own photography, has been a lifelong joy for Bruce, and he looks forward to continue doing both well into the foreseeable future. His next project could be an expansion of his highly acclaimed book, “The Essence of Photography,” with new essays to add to the existing writing of the current edition of the book (in which its German translation was awarded the 1st Place Prize as the best book on Photography published in Germany in 2016, the Deutsche Fotobuchpreis…the German Photography Book Prize). Bruce will be a major contributor to the epic book “Trees of Our Planet,” providing many photographs and an essay about the essential values living trees provide for life on earth, far more than when they are cut down to make products. This will be a groundbreaking book—hopefully a pivotal book—about the relationship between humanity and trees. Planned publication is later this year, though the exact date has not yet been announced. There will be more information later as plans crystallize.